Yushi Minami, Takehide Soh, Mutsunori Banbara, Naoyuki Tamura. Computer Software, 35(3): 65-78, 2018. Tomoya Sunda, Takehide Soh, Mutsunori Banbara, Naoyuki Tamura, Katsumi Inoue. IPSJ Journal, 59(9), 17-A113.R1, 2018. Mutsunori Banbara, Katsumi Inoue, Benjamin Kaufmann, Tenda Okimoto, Torsten Schaub, Takehide Soh, Naoyuki Tamura, Philipp Wanko. Annals of Operations Research, in print, 2018. Takehide Soh, Mutsunori Banbara, Naoyuki Tamura. International Journal on Artificial Intelligence Tools, 26(1):1-29 , World Scientific Publishing, 2017. Journal of Experimental Algorithmics, 21(1): Article 1.12 (44 pages), ACM, 2016. Tatsuya Sako, Takehide Soh, Mutsunori Banbara, Naoyuki Tamura, Hidetomo Nabeshima, Katsumi Inoue. Computer Software, 33(4): 16-29, 2016. Haruki Noritake, Mutsunori Banbara, Takehide Soh, Naoyuki Tamura, and Katsumi Inoue. Computer Software, 31(1): 116--130, 2014. Theory and Practice of Logic Programming (TPLP), 13(4-5):783-798, Cambridge Journals, 2013. Transactions of the Japan Society for Artificial Intelligence, 27(3):204-212, 2012. Fundamenta Informaticae, 102(3--4): 467--487, IOS Press, 2010. Discrete Applied Mathematics, 154(16):2291-2306, Elsevier, 2006. Proceedings of the 23rd International Conference on Principles and Practice of Constraint Programming (CP 2017), 10416, 596--614, 2017. Proceedings of the 11th International Conference on the Practice and Theory of Automated Timetabling (PATAT 2016), pp.13-32, 2016. Proceedings of the 27th IEEE International Conference on Tools with Artificial Intelligence (ICTAI 2015), pp.421--428, IEEE Computer Society, 2015.
aspartame: Solving Constraint Satisfaction Problems with Answer Set Programming. Mutsunori Banbara, Martin Gebser, Katsumi Inoue, Max Ostrowski, Andrea Peano, Torsten Schaub, Takehide Soh, Naoyuki Tamura, and Matthias Weise. Lecture Notes in Artificial Intelligence, Vol.9345, pp.112-126, Springer, 2015. PBSugar: Compiling Pseudo-Boolean Constraints to SAT with Order Encoding. Naoyuki Tamura, Mutsunori Banbara, and Takehide Soh. Proceedings of the 4th International Conference on Algebraic and Numeric Biology (ANB'10), LNCS, Vol. 6479, pp.167-183, Springer, 2012. In the Proceedings of the 19th European Conference on Artificial Intelligence (ECAI 2010), pp.277-282, IOS Press, 2010. In the proceedings of the International Conference on Automated Planning and Scheduling 2006 (ICAPS 2006), pages 103-112, AAAI Press, 2006. In the Proceedings of Workshop on Answer Set Programming and Other Computing Paradigms (ASPOCP), Istanbul, August 2013. In the Proceedings of the Workshop on Constraint Based Methods for Bioinformatics (WCB 2010), pp.54-68, Edinburgh, 2010. Proceedings of The 15th RCRA workshop on Experimental Evaluation of Algorithms for Solving Problems with Combinatorial Explosion, No.16 (15 pages), CEUR Workshop Proceedings (CEUR-WS.org), Vol.451, 2008. In the Proceedings of the 1st International Workshop on Distributed and Speculative Constraint Processing (held in conjunction with CP 2005), pages 25-38, Sitges Spain, October 1st 2005. A description of this workshop can be found in the front matter of CP 2005 proceeding. Takehide Soh, Mutsunori Banbara, Naoyuki Tamura, Hidetomo Nabeshima. IPSJ Magazine, 57(8): 710-715, 2016. Journal of the Japan Society for Artificial Intelligence, 25(1):68-76, 2010.
sCOP: SAT-based Constraint Programming System. Solver Descriptions of XCSP3 Competition 2018 (XCSP18). 第29回RAMPシンポジウム論文集, pp.73--88, 日本オペレーションズ・リサーチ学会 常設研究部会数理計画, 2017. Naoyuki Tamura, Takehide Soh, Mutsunori Banbara. Tomoya Sunda, Takehide Soh, Mutsunori Banbara, Naoyuki Tamura. Tatsuya Sako, Masahiro Kawahara, Takehide Soh, Mutsunori Banbara, Naoyuki Tamura, Hidetomo Nabeshima. Masahiro Kawahara, Takehide Soh, Mutsunori Banbara, Naoyuki Tamura. Naoyuki Tamura, Katsumi Inoue, Hidetomo Nabeshima, Mutsunori Banbara, Takehide Soh. 平沼祐人, 山本泰生, 守屋央朗, Takehide Soh, 岩沼宏治. 第45回バイオ情報学研究発表会, 研究報告バイオ情報学 (BIO), 2016-BIO-45, Vol. 11, pp. 1--6, 2016. Hiromasa Kaneyuki, Mutsunori Banbara, Takehide Soh, Naoyuki Tamura, Katsumi Inoue, 沖本天太. 第18回プログラミングおよびプログラミング言語ワークショップ (PPL 2016) 論文集, カテゴリC1, 2016. Implementation and Evaluation of an Efficient Subgraph Search Tool using SAT Solvers . Masahiro Kawahara, Takehide Soh, Mutsunori Banbara, and Naoyuki Tamura. 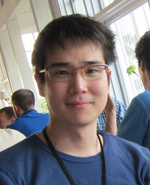 The 32st Conference of Japan Society for Software Science and Technology (JSSST 2015), PPL3-1, Japan Society for Software Science and Technology, 2015.
iSugar : A SAT-based Constraint Solver Utilizing Incremental SAT Method . Tatsuya Sako, Takehide Soh, Mutsunori Banbara, Naoyuki Tamura, Hidetomo Nabeshima, and Katsumi Inoue. The 32st Conference of Japan Society for Software Science and Technology (JSSST 2015), PPL6-1, Japan Society for Software Science and Technology, 2015. A Hybrid Encoding of CSP to SAT Integrating Order and Log Encodings . Takehide Soh, Mutsunori Banbara, and Naoyuki Tamura. The 32st Conference of Japan Society for Software Science and Technology (JSSST 2015), PPL6-3, Japan Society for Software Science and Technology, 2015. Applying Constraint Answer Set Programming to Combinatorial Test Case Generation Problems . Hiromasa Kaneyuki, Mutsunori Banbara, Takehide Soh, Naoyuki Tamura and Katsumi Inoue. The 29th Annual Conference of the Japanese Society for Artificial Intelligence (JSAI 2015), 2H5-OS-03b-5, The Japanese Society for Artificial Intelligence, 2015. JSAI Annual Conference Award. Prototyping Tool for SAT-based Constraint Programming Systems in Scala . Takehide Soh, Mutsunori Banbara and Naoyuki Tamura. Prototyping Tool for SAT-based. The 31st Conference of Japan Society for Software Science and Technology (JSSST 2014), SOFT1-1, Japan Society for Software Science and Technology, 2014. Studies on a Design of Constraint Answer Set Programming Systems . Takehide Soh, Haruki Noritake, Mutsunori Banbara, Naoyuki Tamura and Katsumi Inoue. The 31st Conference of Japan Society for Software Science and Technology (JSSST 2014), PPL2-3, Japan Society for Software Science and Technology, 2014. Solving Numberlink by a SAT-based Constraint Solver . Naoyuki Tamura, Takehide Soh, Mutsunori Banbara and Hidetomo Nabeshima. Solving Post-Enrollment Course Timetabling using Cardinality Constraint and SAT Solvers . Atsushi Sakoda, Takehide Soh, Mutsunori Banbara, and Naoyuki Tamura. The 28th Annual Conference of the Japanese Society for Artificial Intelligence (JSAI 2014), 1D5-OS-11b-7, The Japanese Society for Artificial Intelligence, 2014. SAT-based CP System Scarab and its Application to Hamiltonian Cycle Problem . Takehide Soh, Daniel Le Berre, Stéphanie Roussel, Mutsunori Banbara, and Naoyuki Tamura. The 28th Annual Conference of the Japanese Society for Artificial Intelligence (JSAI 2014), 1D5-OS-11b-6in, The Japanese Society for Artificial Intelligence, 2014. Constraint Modeling and SAT Encoding of the Packing Array Problem . The 30th Conference of Japan Society for Software Science and Technology (JSSST 2013), PPL1-1, Japan Society for Software Science and Technology, 2013. Scarab: A Prototyping Tool for SAT-based Constraint Programming Systems in Scala . Takehide Soh, Naoyuki Tamura, Mutsunori Banbara, Daniel Le Berre, and Stéphanie Roussel. The 30th Conference of Japan Society for Software Science and Technology (JSSST 2013), PPL2-5, Japan Society for Software Science and Technology, 2013. Constraint Models of the Square Packing Problem and their SAT Encodings . The 27th Annual Conference of the Japanese Society for Artificial Intelligence (JSAI 2013), 2E5-OS-09b-1, The Japanese Society for Artificial Intelligence, 2013. Constructing Packing Arrays by SAT Encoding. The 15th JSSST Workshop on Programming and Programming Languages (PPL 2013), C1 category, Japan Society for Software Science and Technology, 2013.
International Journal On Advances in Life Sciences, 4(3-4):154-165, 2012. The 4th International Conference on Bioinformatics, Biocomputational Systems and Biotechnologies (BIOTECHNO 2012), pp.11-19, 2012. IPSJ SIG Technical Report, Vol.2012-ICS-165, No.7, pages 1-6, 2012. The 24th Annual Conference on Japanese Society of Artificial Intelligence (JSAI 2010), Nagasaki, Japan, 2010. The 23th Annual Conference on Japanese Society of Artificial Intelligence (JSAI 2009), Takamatsu, Japan, 2009. Naoyuki Tamura, Akiko Taga, Mutsunori Banbara, Takehide Soh, Hidetomo Nabeshima, and Katsumi Inoue. Proceedings of the Scheduling Symposium 2007, pp.97-102, The Sceduling Society of Japan, 2007. Technical Report of IEICE, 106(38): 19-24, The Institute of Electronics, Information and Communication Engineers, 2006. Technical Report of IEICE, 104(133): 19-24, The Institute of Electronics, Information and Communication Engineers, 2004.